Not your average pizza topping is it? But, it’s become my signature. 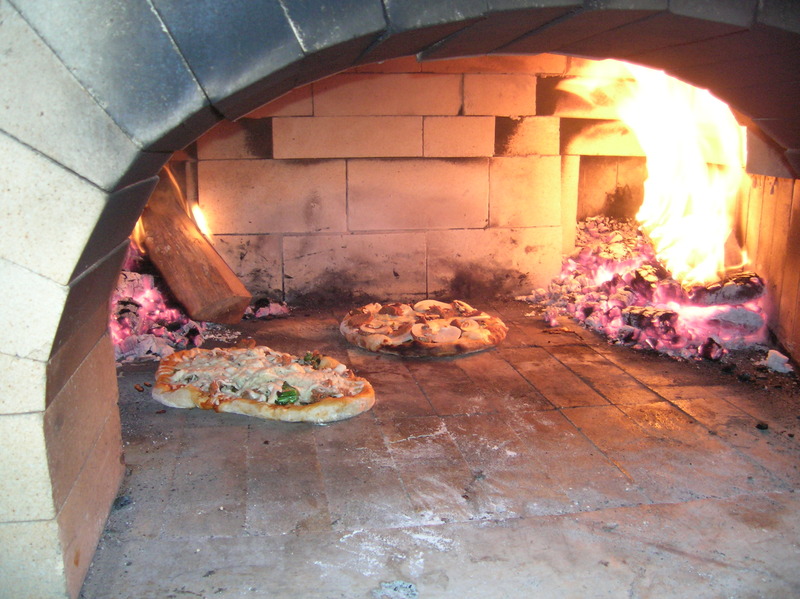 Every week our pizzas sport a concoction of caramelized onion, olive oil, greens and garlic. I figure, there’s just not enough green in the world, so any chance to pair it in an uncommon way, and I will. 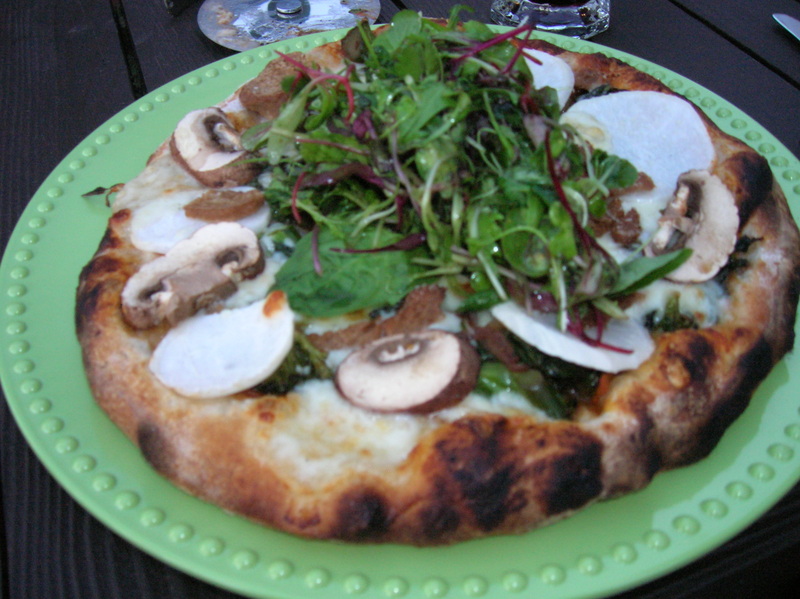 We also serve a simple field green salad to top every pizza! This slightly sweet vinaigrette pairs wonderfully with the rich savory flavors of cheese, crust and sauce. The pizza below is host to many local Minnesota veggies straight from the CSA box: turnips and their greens, broccoli, red onion, garlic, and brussel sprouts. Directions: To caramelize onions I place them in a saute pan on high heat until they begin to brown. Then I turn the heat down and allow them to slowly cook for about twenty minutes stirring every now and then. Add salt and pepper and garlic until fragrant, then add the greens. Saute until the greens are tender and bright green. Careful not to overcook as they will cook more on the pizza. If you choose to add the brussel sprouts, cut them in half and cook them with the onions so they get nice and browned. 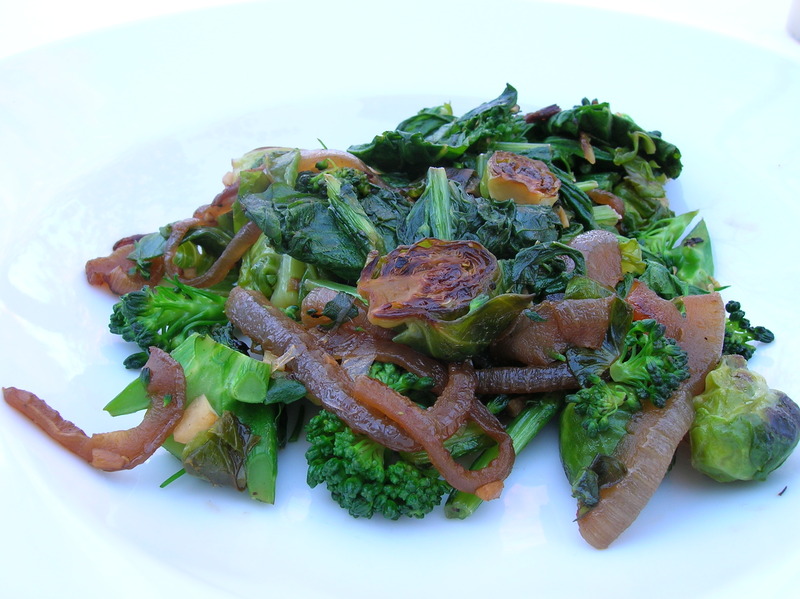 Other greens can be added at the end of the cooking time. Of course, Kale needs a few minutes more than tender greens. That fire swooping up over the top just amazes me! I’ve really been moving towards simple lately; cleaning out the basement, organizing cabinets, and sending excess stuff off to the thrift store. It’s such a liberating feeling for me to see a basement storage shelf empty, old things out with no new to replace, and clean uncluttered lines as I look around the house. The same goes for my food. I love the surprise of layered flavors, but lately I’ve wanted to shed a few pounds. To do this I have opted for simple, unadulterated and mostly raw. I figured, it’s so easy to over-eat when food is rich and delicious, so I thought if I keep my food simple, I won’t be overly preoccupied with it. I’m trying to cut my addiction to a high calorie and high-carb diet by changing my thinking and simply focusing less on food. To get my mind off food, I’ve lowered my carb intake to about 30 percent of my daily calories. I’m staying away from grains and sugars, and am eating mostly salads and beans. I’m also eating most of my calories in the early part of the day and staying away from food after four in the afternoon. I think summer and having the CSA veggies has made this really easy to do. Basically what this means, is I am doing lots of veg prep and very little cooking. I’m spending little time in the kitchen or dining room, and having very few dinner parties. I’m doing everything I can to stop thinking about food so much – have you noticed? Saute the kale in a large skillet in just a bit of olive oil. Lower the heat, cover and let it steam for a few minutes until bright green and tender. 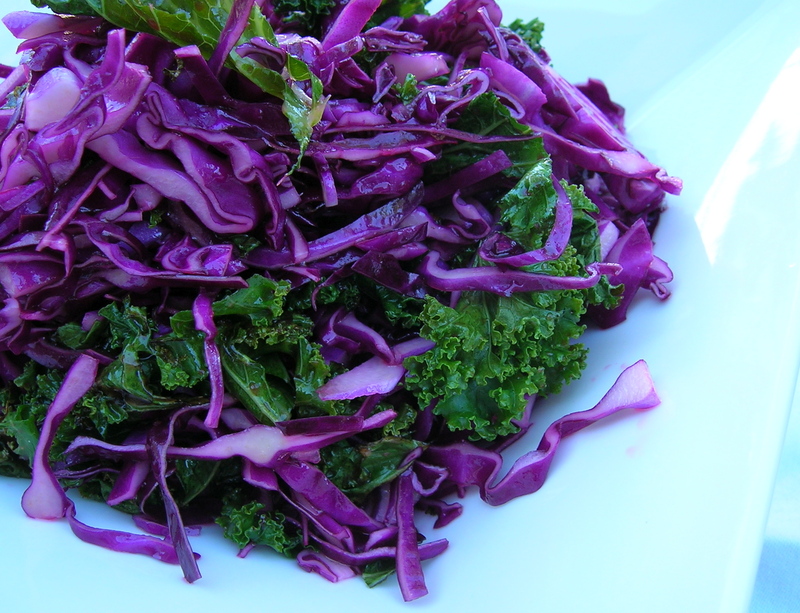 Mix the red cabbage, kale, lemon juice, olive oil, agave and salt in a large bowl. Allow the salad to marinate in the fridge for at least an hour. This is one of my favorite kitchen games as of late! How many different ways can I sneak these tuberous rubies into the food we eat? Most creative wins! This week we’ve had them in apple crisp – that was tasty – and now they are pureed and hanging out in the latest version of Black Bean Chile. All that manganese, folate and fiber are said to fight against colon cancer. Hopefully my game has a payoff. You probably won’t be able to replicate this recipe unless your freezer looks like mine: pesto, homemade chile paste and corn, but remember, Chile is a great place for hiding nutrient rich tidbits! Last summer I took three or four huge bags of dried chiles (chipotle, guajillo and de arbol), reconstituted them and made them into a paste which I froze in a cake pan and then cut into squares for individual servings. I didn’t record the recipe and don’t remember how it was done…sorry. We can’t handle too much corn-on-the-cob around our house. Max has braces which makes it impossible to eat with the cob, and the richness of corn hits my satiated level after one serving per year. We’ve had corn for the last four weeks from the farm, and I’ve been zapping it in the microwave, shucking it, removing from the cob and freezing. Today I set out to tackle the last fifteen ears in our fridge only to discover the new batch was perfectly white and bodacious. Along with this perfection in the box came some very sassy Biscayne Peppers just asking to be blister roasted. The wheels started to churn, and the idea of a bean infused corn chowder came to be. I like the idea of adding some protein in order to complete the amino acids needed for perfection, and to be able to balance out this giant carb load. Corn: My technique for the corn involves a five for five method. Take five ears of corn, husks and all, and zap them in the microwave for five minutes. Take them out and let them cool on the counter for a few minutes before you pull off all the husk and silk. If you are used to removing the husk prior to cooking, you will be amazed by how simple it is to do this way. Once those are all cooked, cut the kernels from the cob. Now, let’s get this soup cooking. Dice your onions and put them into the hot oil in a stock pot. Cook them on a low heat while you mince the garlic. Toss in the garlic, cumin, chipotle and sage. Let the aromatics cook and the spices toast a little. Now add the water, corn and beans. Lower the heat to a simmer and cover the pot. Roasting the peppers: Use an all metal set of tongs to hold the peppers directly over the flame on your stove. They will begin to crackle and blister. When the skins turn mostly brown with spots of black, turn them. This will take a few minutes to completely char both peppers. Don’t be afraid to just set them on the stove racks for a few moments then flip. Once they are completely blistered, set them aside to cool. It also helps to put them in a closed paper bag. The steam from the hot chiles helps the skins peel off more easily once they cool. I’m not patient enough to spend much time waiting, so I usually run them under cold water and rub the skins off. Then all you have to do is slit them open with a knife to remove the seeds, take off the stem, and dice them up. Finish the chowder by adding the diced chiles, salt and pepper. Taste to adjust seasonings and serve. Does anyone in Minnesota grow pineapple? I didn’t think so. This chip topper is far from local, but a real crowd and kid pleaser. The only thing local, in fact, is the cilantro and jalapeno. This one tips over my 80% local goal! This is a zinger. Toss everything in the food processor and pulse, pulse, pulse. The only thing I would caution is if you plan to feed this to kids, check the heat of your jalapeno. I have found that organic jalapenos tend to be pretty hot. I’m not sure if that’s due to the producer or what. My trick for testing the Scoville level is to cut off the stem and a little of the pepper. Then I give the cut part with all the capsaicin a quick lick. With that test I know if I need to remove the seeds or if it is safe enough for my easy method – throw the whole darn thing in! Doesn’t this just look autumnal? I never noticed light quality as much as I have since I started snapping pictures of food. Using natural light in the late afternoon with late August sun is enough to remind me that winter in the Northern Hemisphere is heading in this direction. Fortunately, we have stacked enchiladas to warm the way. The other day when I woke up thinking “Mexico,” I cooked eight pounds of black beans in order to have them on hand in the freezer. The only CSA produce remaining in the crisper were a pound of tomatillos and four yellow squash. As you know, the tomatillos got a spin around the salsa dance floor while the yellow squash demanded to be sliced up into buttery yellow ribbons. The yellow squash didn’t really get the parade it deserved with this dish, but added a sweet color and flavor when sautéed with strips of onions and little slivers of garlic before being sandwiched between two giant tortillas. Not wanting to hide the layers and completely smother the enchilada in sauce, I only used a little tomatillo salsa to dress-up the stack. Extra salsas were served on the side along with cotija, crema and fresh avocado. Part of the fun of this enchilada is its size. I wanted a giant single stacked enchilada that could be sliced like a pie for serving, so I made giant tortillas from maseca. I used a spring form pan so the thing wouldn’t slide, but in the end, could have baked it on the plate. As it’s a dry enchilada, it didn’t move at all. If the tortillas had been a little bigger, it would have been fun to really pack the springform pan full, so the enchilada would have a more cake-like shape. I’ll save that experiment for later. Directions: I have found that the directions on the maseca bag make the tortillas a little too dry. I add water to the maseca flour until I get nice smooth dough when it’s kneaded. Form the dough into a cylinder and cut into six pieces. To make the tortillas you will need two pieces of plastic wrap and a large flat object to press the tortilla. I used the bottom of the spring form pan, but a small cutting board would also work. Roll the tortilla dough into a ball and gently press and flatten until you get a disk shape. Dip your fingers in a little oil at this point and cover the dough with it. Place the disk on the plastic wrap and cover with another piece of plastic. Then place your pie pan bottom or cutting board on top and press firmly until the tortilla is about 1/8 inch thick. The edges of the tortilla will split open, so I usually push all the edges together before I cook it. To cook the tortilla you need a griddle on medium temperature. Place the tortilla on the griddle and cook it until it starts to show spots of brown then flip it. Each tortilla usually needs three to four minutes per side. Peel the yellow squash with a potato peeler leaving the seeds. You only want the firm seedless part of the squash. Slice the onion rounds and then from the middle of the onion to the outside make a cut, so when the onions are sautéed they will form strips. In a little olive oil, sauté the onions until they become translucent then add the garlic and squash. Cook until the squash is just tender. To make the enchilada stack, put a little tomatillo salsa on the bottom of the pan and then a tortilla. Alternate each stack with black beans, cheese and the sautéed squash. Cover the enchilada with grated cheese and bake for 30 minutes on 400 degrees. The cheese should be bubbly and beginning to brown. Garnish the enchilada with more tomatillo salsa and fresh cilantro. Mexican cotija, crema and fresh avocado give it a nice finish. There is nothing better on a beautiful summer day than sitting outside sipping cold beer and dipping the old chips into something hot and spicy. I woke up thinking Mexico, and when I opened the fridge, the Minnesota tomatillos were just begging for a salsa lesson. Once I got started, the jealous garden tomatoes wanted to be spun around too. I ended up with the tomatillo, a roasted tomato and fresh tomato salsa. The tomatillo and roasted tomato are basically the same salsa only one has tomatillos and the other tomatoes. All the ingredients get roasted on a sheet pan under the broiler until they start to blacken, then they get a zing through the food processor with lime juice, cilantro and salt. * While I prep the ingredients for these salsas, I wrap a head of garlic in foil and place it in the oven at 400 degrees to roast it. When the other ingredients are ready to broil just toss the garlic on the sheet pan so it can continue to cook a little longer. Line a large sheet pan with foil. Lay out washed tomatillos, chopped onion and jalapeno on the sheet. If you haven’t already started the garlic, that can be wrapped in foil and placed on the sheet pan as well. Place the vegetables under the broiler. Watch them carefully so they don’t burn. I roast them until everything has a blackened spot on it. The onions take a little longer, so sometimes you may need to move things around so the tender veggies are further away from the heat. Once they are blackened a bit, set them aside to cool for a minute. When they are cool spoon them into a food processor and add the cilantro, lime juice salt and two of the roasted garlic cloves. Run the processor until the salsa is smooth. Refrigerate before serving. Follow the same directions as for the tomatillos above. It’s very easy to make both of these recipes on one sheet tray together. A while back I posted this recipe but used red onions instead of white. These ingredients get a few pulses in the processor and you are ready to eat. Enjoy! I have no idea what this fruit is! It came in the CSA box and was simply called, “melon.” One of the melons has a soft white flesh that is ridiculously juicy. The larger melon in the back is more like a crispy cantaloupe and both are very sweet. Since they’re so sweet and juicy, I am going to pretend like I am still living in Ecuador and juice them! The first few weeks that I lived in Ecuador I would be greeted at the breakfast table by a pitcher of brightly colored juice that I could not always identify by taste. It was then that I learned about tomate de arbol, tamarindo, and maracuya. Every household with electricity has a blender where these fruits or others like papaya, cantaloupe, pineapple and watermelon were blended along with a little sugar. Some of the fruits like orange, lemon, lime and grapefruit were of course squeezed. This juice recipe includes the fruit of three melons and three cukes. After peeling the fruits and removing the seeds, I ran the blender until the fruit was very fine, and then pressed it through a sieve. It’s a fairly thick juice, so if you prefer a little more liquid, add about two cups of water and mix it together. I also did not add sugar, as the melons were very sweet on their own. I can close my eyes while I sip this juice and travel back to Ecuador 1991! Isn’t it amazing how food causes time travel? Here’s a lovely little first course for an Italian inspired meal. The three cheeses include goat, habanero, and cheddar, and to sweeten it a little, fresh strawberry jam, nectarines and grapes. Simple and succulent. If you’ve been to Peru or Ecuador, you know the world’s most famous ceviches. Creamy white pieces of fish tenderize and mellow as they are bathed in a marinade of lime juice and salt. Added to the mix are thin slivers of red onions, green pepper, the aji chile and tiny specks of cilantro. Ceviche is served cold, mostly in the coastal areas, and usually next to an icy beer. It pairs nicely with “patacones” or fried and salted plantains. Since I thankfully don’t receive any fish in my CSA box, and wouldn’t eat it anyway, I opted instead to turn my lovely sweet corn into a ceviche of great Midwestern style. Everything in this ceviche is local with the exception of the lime! Having no green peppers at the moment, I instead opted for diced cucumbers to give the salad a little color and crunch, and used the red Thai Chiles I bought last weekend at the Kingfield Farmer’s Market to spice it up. Here’s how my nine-year-old son described it when he gave it a taste – word for word, “Wow! First you taste the lime, then you get a little zing from the peppers, but then it gets all sweet and mellow from the corn.” He may end up as a part time sommelier if he keeps talking like that! 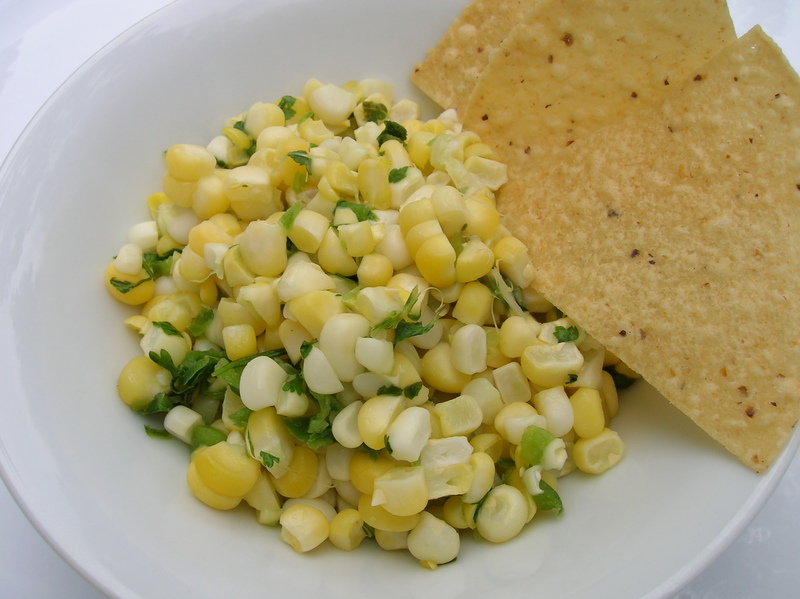 The only fussy thing about this ceviche is cooking the corn and cutting it from the cob. I’m sure you could use frozen corn if you want to make the recipe, but skip the fuss. I’m a firm believer that corn, like asparagus, should only be cooked for two or three minutes in boiling water. As I clean the corn, I get a big pan of water boiling and only when it is furiously bouncing on the stove do I drop in the ears of corn. I quickly replace the lid, check the clock, and remove after no more than three minutes. Perfection! Cook the corn and cut the kernels from the cob. Dice the onion and the cucumber and mix in bowl with corn. In a food processor, chop the chiles and the cilantro. Mix everything together and add the oil, lime juice and a sprinkle of salt. Enjoy! I’m sorry, I’m sorry, I’m sorry. I left you hanging yesterday with only a page number for this amazing sauce to scoop up with your spicy green beans and brown basmati. This fabulous Indian recipe is from Madhur Jaffrey’s World Vegetarian and can be found on page 663. It’s another mustard seed popper – I love that! I also love cilantro more than any other herb in the world, but have heard that some people don’t – I can’t imagine! This sauce is fresh and enormously flavorful and despite the fact that it has chiles in it, does not burn. In fact, it’s a great cool down accompaniment for spicy Indian dishes. This recipe is so perfect that I do not improvise, but I do, of course, cut a few corners here and there. You know me. You may use 1 cup unsweetened dessicated coconut soaked in 3/4 cup of hot water for 30 minutes instead of fresh coconut, if you prefer. Use the soaking water as you grind. First shortcut – I will absolutely use unsweetened dessicated coconut because I’ve lived in Latin America and I know how tricky it is to remove fresh coconut flesh. Second shortcut – Put the coconut and water in a bowl and zap in the microwave for 2 minutes. While it’s cooling down, mix the other ingredients in the food processor or blender. Heat coconut with water in a microwave for two minutes. Let it sit until you mix all the other ingredients. In the food processor, pulse to chop the ginger, serrano peppers and shallots. Next add the cilantro and pulse. Scrape down the sides if you need. Add salt, sugar and lemon juice. Process until everything is chopped and starting to create a paste. Add the coconut and blend again. If it seems dry, you can add a drizzle of water. In a saute pan heat the oil and add the mustard seeds. When they start popping, pour the oil and seeds into the coconut chutney and mix again. This chutney is served cold, so should be chilled in the refrigerator. According to Ms. Jaffrey, it should last 3 to 4 days and can also be frozen. Oh, heavenly deliciousness! Ever since my friend, Kate gave me a copy of Madhur Jaffrey’s World Vegetarian, I’ve been playing around with Indian spices. I’ll be the first to tell you that I have no idea what I’m doing, but have been getting some pretty tasty results. Every time I mess with Indian, I imagine one of the Chowdhury family mamas is over my shoulder tisk, tisk, tisking me! Tonight I actually looked to see if somebody was there. I love the spices, and I am sure there is a provincial rhyme or reason as to why some go together and some do not. At this point in time, I am experimenting to see what I like – being the great fusionist that I am! I love putting the brown mustard seed into hot oil until it pops and then sprinkling the other spices in and watching them bubble furiously in the oil. The aroma they give off just sends me to the moon! Fabulous. These green beans got simmered in savory Indian spices along with some Thai hot chiles from the Kingfield market and some basil from the CSA. This is truly a simple dish to be enjoyed with a side of brown basmati and coconut chutney (p. 663 in World Vegetarian). Clean and cut the beans into small pieces. Mince the chiles and basil. Heat oil in saute pan and add mustard seed. When mustard seeds begin to pop, add the other spices. Stir them and let them cook for a moment. Then add the beans, basil, and chiles. Mix them around in the spice mixture to coat. Add a splash of water and cover the pan to cook for five minutes. I like my beans firm, so you may choose to cook them a little longer. Salt to taste. The day I met the Pupusa was one of the happiest days of my life! I became a traitor that day – falling in love with something I could not have – giving my allegiance to another country’s cuisine. I was a Peace Corp Volunteer on vacation in Guatemala from Honduras where food is more practical than delicious. After a year of vainly searching for something satisfying and vegetarian, I had finally found a Central American foodstuff I could love. I found the Pupusa! It was December 1994 and Jeff and I were strolling through the Plaza Central in Antigua, Guatemala when we saw a woman making these fat stuffed tortillas. Central America is famous for making a thicker pancake-like tortilla than the paper-thin Mexican version, but these were downright chubby. We watched mesmerized as she took a ball of masa (corn flour dough), patted it out into a little cup formed in the palm of her hand, stuffed it with cheese and other savories, then sealed it all up. Then she skillfully smack, smack, smacked it back and forth in her hands forming it into a fat tortilla and tossed it on the comal, a griddle in Latin America. When they were perfectly crisp and piping hot, she served them up on a piece of brown paper along with some spicy pickled cabbage and hot sauce. This was the pocket sandwich of my dreams! It turns out the Pupusa is the national street food of El Salvador, and despite a trip to that country, we never ate Pupusas again in Central America. Many times, since our return to the States, have I tried to recreate the Pupusa. But not until today, have I been successful! And there is a trick – a secret Pupusa trick – oil! The Pupusa maker needs a little bit of oil on the finger tips when forming the final Pupusa tortilla, and had it not been for YouTube, I think I very well could have lived out the rest of my life attempting, unsuccessfully to make the Pupusa. Note: If you live in an area with Latino markets, you can buy fresh masa which is better than Maseca. Mercado Central in Minneapolis sells masa in bags at the Tortilleria. Directions: Mix the dough in a bowl adding the water until the dough is soft and doesn’t break apart when you test-run a tortilla. The edges will crack open a little, but you want enough water so the tortillas don’t totally break apart. I think it is safe to say you could put nearly anything in a Pupusa as long as it is not too wet. Today I used mashed black beans and fresh mozzarella that I ran through the food processor. If you are not well practiced with the smack, smack smacking of tortilla formation, I recommend you use two pieces of plastic wrap and a flat round plastic lid to form them. Once you fill the Pupusa and close the dough around the filling, form it into a flattened disk by placing it between the plastic sheets and gently pressing on it with the plastic lid. Remove the top sheet of plastic, and with your finger, close all the cracked edges of the Pupusa. Again, there are lots of demonstrations on YouTube to help you through the process. Enjoy! Mix together and allow to sit for a few hours before serving with pupusas.